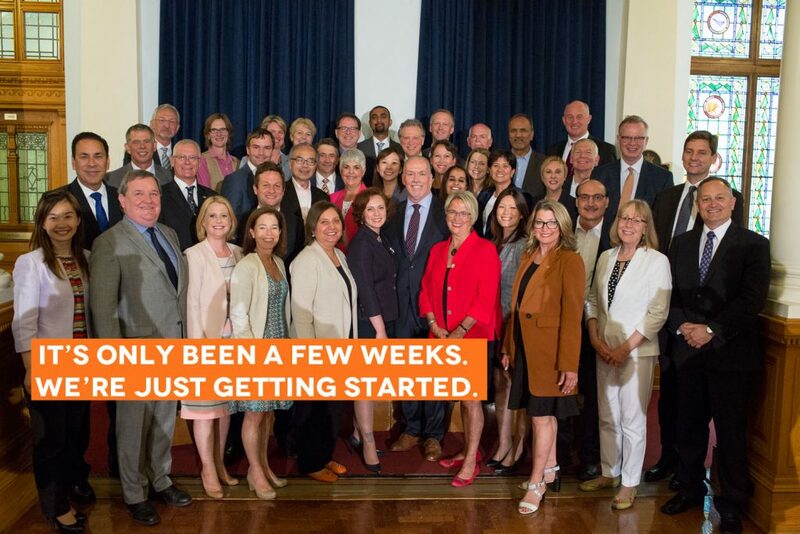 VICTORIA – Premier John Horgan and the New Democrat government have been working hard over these first few weeks, making a better B.C., following 16 years of a B.C. Liberal government that only cared about their wealthy friends and supporters. Since July 18, when Premier Horgan and his cabinet were sworn in, the new B.C. government has been working to make life more affordable for British Columbians, create good jobs and opportunities across our great province, and restore and strengthen important services. Immediately following the swearing-in of the new government, Premier John Horgan and the new B.C. government made addressing the wildfires and supporting people and businesses affected by them the most urgent priority. Within 24 hours, a task force that includes members of cabinet was established that immediately went to the front lines to determine the scope of the problem, and determine what was needed. The new government also pledged ongoing financial support for people forced to evacuate their communities until they are allowed to return home. The New Democrat government took action on our commitment to protect British Columbia’s interests in the face of the proposed expansion of the Kinder Morgan pipeline and increased tanker traffic. New Democrats said they would use every tool in the toolbox to protect our economy, environment and thousands of existing jobs, and that work has begun. The first steps include securing Thomas Berger as external legal counsel, seeking options for the B.C. government to participate in legal challenges, and ensuring the province engages in meaningful consultation with Indigenous people concerning the project. Under the B.C. Liberal government, B.C. was the only province without a Human Right Commission, and British Columbians deserve better. That’s why John Horgan and the New Democrat government announced they will re-establish a human rights commission to fight inequality and discrimination in all its forms. Premier John Horgan wants to make it easier for all British Columbians to get ahead. Removing financial roadblocks like these is an important step towards investing in an economy that works for everyone. The B.C. Liberal government refused to allow our independent energy watchdog to examine the Site C project. Instead, the B.C. Liberals just wanted to “get it past the point of no return” unscrutinised, and regardless of whether there would be a massive financial impact on people across the province. As promised, the New Democrat government is finally sending the project to review so that the best-informed decisions can be made in the interests of B.C. families. The previous B.C. Liberal government were only looking out for their wealthy friends, while everyone else was left to fend for themselves and the most vulnerable suffered. The New Democrat government is there for people, and this immediate increase was an important part of our government’s commitment to create a comprehensive poverty reduction plan. As concerns mounted about the safety of drinking water, people in the Hullcar Valley were hitting brick walls with the previous B.C. Liberal government who seemed mostly unconcerned. The new government has announced a new review to ensure agricultural practices are consistent with ensuring safe drinking water. Owning the Waneta Dam and generating station is expected to help keep rates affordable for British Columbians, and will support local jobs for many years. The first priority of this new ministry is to save lives immediately in the face of the overdose crisis, and this involves meeting with people on the front lines of the crisis. Under the B.C. Liberal government’s watch, childcare became less and less accessible, and more and more expensive – forcing some parents to make tough decisions about their careers. As promised, Premier John Horgan and the New Democrat government want to make child care affordable, and a first step toward that was to establish a Minister of State for Childcare.